We round up common mistakes tech recruiters make and a few best practices to adopt instead. What is your top recruiting pet peeve? 1. Sending form letters — or even worse, broken form letters. Unless someone is job-seeking and not getting many offers, chances are your form letter won’t stand out or get much interest. And if your form letter is broken and has [NAME] where a candidate’s name should appear, forget about getting any qualified candidate responses. Be sure to spell the candidate’s name correctly, and typing “Mr.” or “Miss” in the greeting could be a big mistake. For example, I can’t tell you how many “Mr. Endsley” messages I get every month, and “Miss Endsley” won’t sit well with me, either. 3. Not understanding what the recruit does. Potential candidates can tell whether you’ve done your homework, dug through their LinkedIn profiles, and have a grasp of their backgrounds, experiences, and areas of interest. Reaching out to a UX designer about an engineering role won’t get you good results. 4. Sending unsolicited contact requests. 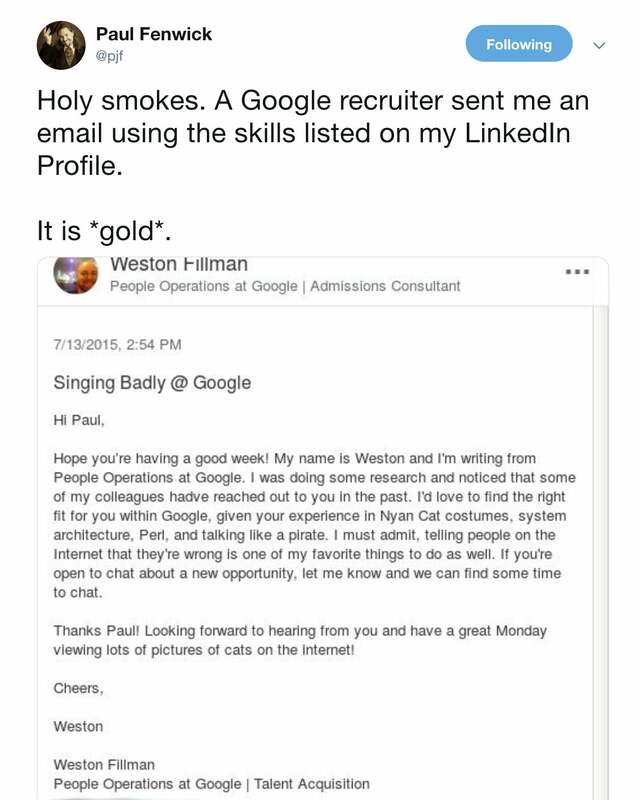 Don’t send LinkedIn connection requests to people you don’t know. Just don’t do it. 5. Being too general about the job position. Kill the coy. Share as many details you can about the role, including any must-have and nice-to-have skills. Draw potential recruits a picture of what the work looks like to make qualified candidates take notice. 6. Being too vague or mysterious about the team and company. Tech professionals with in-demand skills and experience are being more selective about what kind of team dynamics they walk into and organizational ethics. Letting potential hires know right away what the team looks like (e.g., small vs. large, remote vs. on-site) and which company you represent can save everyone a lot of time. 7. Having unrealistic or overly specific requirements. Does the right candidate really need to be an expert in every technology and programming language and hold multiple degrees? Be clear about what skills a candidate needs vs. what skills might come in handy or can be acquired on the job. 8. Getting too cutesy or culture-y in a description. Not all of us consider office puppies, free booze, and ping pong to be job perks. If this is the messaging you lead with, you’re going to attract a pretty specific kind of applicant and quickly narrow down your list of potential candidates. Also avoid terms like “guys,” “rock star,” and “recent graduate,” which can translate to “women, minorities, and anyone over 25 need not apply.” Ouch. 9. Asking for referrals to other potential candidates. This is a no-win for recruiters. For example, I’m happy to recommend job seekers in my network for roles, but lots of other folks working in tech see this as lazy recruiting. The safest approach might be to ask a candidate later in the process, after you’ve developed a friendly working relationship and you've both agreed that this role doesn’t quite fit their interests or expertise. Then they might have other contacts in mind for it. 1. Provide a sincere and personalized greeting. A personalized greeting goes a long way. Let potential candidates know you understand their previous work experience, you’re familiar with what they do, and that you have an idea of what they want to be doing. 2. Offer a transparent description of the team and the role. Be as clear as you can when describing the team and the role. Using words like “rock star” or “fast-paced team” does nothing to help the potential candidate visualize what they’d be walking into. Is this a small team? Remote team? Being mysterious about the role won’t build intrigue, so opt for transparency. 3. Give the company name. Telling job candidates that the organization is a startup or a Fortune 500 company also won’t work as well being transparent about the organization from the beginning. How can anyone know whether they’re interested in a role if they don’t know which organization they’d be joining? 4. Be persistent and specific. In addition to providing the job description and company name, specifying the salary range and why you think the potential candidate is a good fit for the role stands out. Also consider specifying the work authorization and whether the organization provides visa sponsorships, relocation, and additional benefits beyond an hourly or annual salary. If you have a good feeling about a candidate who might not be a 100% technical fit with the job posting, let them know and open those lines of communication. 5. Invite potential candidates to local recruiting events. The event should provide brief presentations about the company, refreshments, and a networking opportunity. Here’s your chance to show off the culture (i.e., people) part of your organization in person. 6. Maintain a relationship with potential recruits. If you talk to a candidate who isn’t the right fit for a role, but who would be a great addition to your organization, keep the lines of communication open. If candidates have a good experience with a recruiter, they’ll also be more inclined to join the organization later or send other job seekers their way in the future. Keep in mind that recruiters, like you, are just trying to do their jobs. If you're tired of hearing from recruiters and annoyed when they contact you, step back and get a little perspective. Although you might be in the fortunate spot of being happily employed and in-demand, not everyone else is. Grumbling about recruiters on social media is a great way to humble brag, but not the best way to show empathy for the job-seekers or win any friends. Thank you to the many people who contributed to this article! What would you add to these lists? Let us know in the comments. Be more prepared, confident, and impressive at your next job interview with these strategies. Avoid being another faceless resume in the stack with a cover letter that shows how you're better than the rest. Working on open source projects can give you experience and connections you'd probably never get anywhere else. Fostering a diverse, inclusive work environment is more important than ever—especially for DevOps teams, where candidates often call the shots. Here's how one situation went wrong, and some questions to keep your hiring on track. Never require me use Skype or any close source software I not have for internet interview. A recruit company in Japan refuse use Jitsi or telephone or interview because "their procedure". No internet cafe here have it. Goal is interview me. Not every person want use or have Skype, Skype ID. I later find have web Skype (company not tell me this, I think they not know) but still not solve Skpe ID problem. I voted for "Other." The primary reason is that I have been experienced almost all of the stupid moves in the list. There have only been about three times when a recruiter called me out of the blue and within 15 seconds was able to convince me to talk to them. That is my $MaxTimeLimit before I just hang up or delete the email. I reach that limit sooner if they get basic facts wrong that they could have gotten from my CV like what my skills really are and that no number of degrees will produce the skills I actually do have. I did make the mistake of responding to one otherwise decent recruiter despite the fact that the job description contained the word "rockstar." That job was a disaster that had already happened. Another thing I hate is the ageism. I am now aged out of any job market and am much happier writing for Opensource.com and books about Linux. But when I did encounter this it was usually in the form of a quick brush-off early in the interview and some lame excuse about running late or other nonsense like "overqualified." Most places I actually ended up interviewing at never really had any decent method for verifying the information I put in my CV about my skills. They mostly had to go on the assumption that I was not lying or at least embellishing. It is a bad sign when the only person that interviews you for a job knows little or nothing about the technical aspects of the job you will be doing and does not invite anyone on their staff who actually does to participate in the interview. My top peeve, with daylight second, third, and fourth, is Never Hearing Back. Agreed, that's a big one. I'd prefer a curt rejection over being left hanging.